Rugosa was a temperate moon orbiting a blue planet and was located in an Outer Rim system proximate to the planet Toydaria. The moon had once been covered by vast oceans, in which massive coral formations and reefs grew; however, the moon dried up, exposing the coral forests across the moon as well as fossil remains of native species. The massive coral formations varied in color, from green to blue to purple, and included various forms, from large fan-shapes to antler shapes, to porous spheres. Some were large enough that starships such as the Thief's Eye could comfortably land on them. Fauna on the moon included the diminutive neebray. These flying creatures lived in amongst coral. 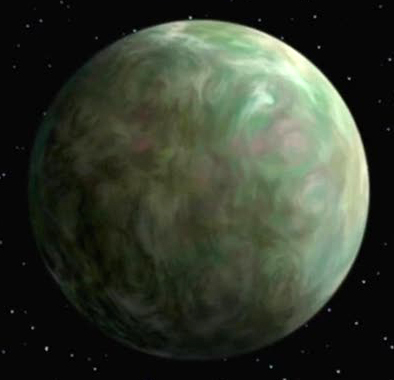 During the Clone Wars, the moon was chosen by King Katuunko of Toydaria as a neutral meeting place to negotiate with an envoy from the Galactic Republic. Katuunko requested a Jedi as the Republic envoy, and Jedi Master Yoda was chosen to open the negotiations with the King. However, this plan was intercepted by a Confederacy of Independent Systems listening post on the Mid Rim world of Ruusan, and reported to the Confederacy leader Count Dooku. In order to disrupt the plan, Dooku dispatched his disciple Asajj Ventress to convince or coerce the Toydarian King to become a Separatist ally instead. Yoda was ambushed en route, but still managed to crash land on the moon with three clone troopers. Ventress made a bet with Katuunko that if Yoda could make it to the King alive, the Republic could gain allegiance of the moon; if not, Toydaria would become an ally of the Separatists. Despite Ventress' best efforts, Yoda, together with the three clone troopers, survived to reach the King. Attempting to go back on her deal, Ventress was ordered, by Dooku, to kill the King. She swung her lightsabers in a killing strike but they were halted at the last instant by Yoda's Force grip. Ventress subsequently fled the moon, and King Katuunko, impressed with Yoda's deeds, signed a treaty with the Republic, allowing them to establish an outpost in his territory.